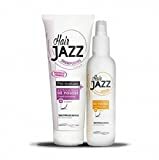 250 ml of shampoo ,200 ml Lotion BENEFITS OF HAIR JAZZ: 1.HAIR JAZZ makes your hair stronger; 2.Your hair will become softer and shinier; 3.Proven efficiency on all hair types; 4.A visible reduction in hair loss; 5.Your hair will grow up to 3 times faster. When the results were compiled after 30 days, they showed: •A maximum growth of 1.8 inches •An average growth of 1.14 inches Hair grows on average, about a half inch a month. What are the active ingredients in a Hair Jazz set? 1.Soy protein 2.Vitamin B6 3.Keratin 4.Egg shell extract 5.Chitin Cruelty-Free .Do not contain Sodium Lauryl Sulfate, silicones or parabens HAIR JAZZ is our brand new plant-based food supplement formulated with nutrients, hyaluronic acid, collagen, amino acids and keratin for 4-in-1 action: growth + hair loss prevention + shine + hair colour. USAGE: Every 2-3 days wet hair remove a small amount of shampoo and fingertips gently massage entire scalp for 1-2 minutes. Hold for 2 minutes and rinse with warm water. In case of contact with eyes, rinse thoroughly with water. Wash, shampoo, distribute the lotion on the scalp. Fingertips gently massage the instrument into the scalp for 1-2 minutes. Do not rinse. Two tubes provide enough product for 1-2 months of treatment if applied 2-3 times a week. •Cruelty-Free •Do not contain Sodium Lauryl Sulfate, silicones or parabens. Objective: prevention of hair breakage and hair loss protection Nutricible 111 Apple (flavan-3ol-based active ingredients) contributes to eliminating free radicals in order to fight against the premature ageing of hair and stimulate peripheral microcirculation, thanks to the combined action of blueberry extract. Objective: Growth Wheat protein hydrolysates combined with bamboo rich in silica, provide the ingredients essential to form the keratin required to develop new hair fibres.